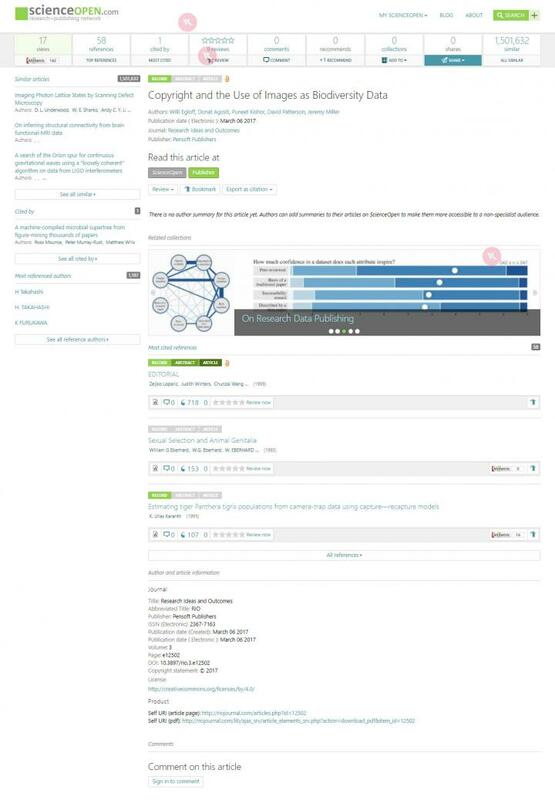 While the articles' underlying data, such as author names, citations, keywords, journals and more, are automatically harvested and analyzed by ScienceOpen, so that research items can be easily interlinked, readers are encouraged to further provide context to the research items. The user-friendly intuitive interface invites them to add their comments, recommendations or open post-publication peer reviews, and even create their own topical collections regardless of affiliations and journals. "We have long worked closely with ScienceOpen, as it only makes sense given our shared vision for the future of academia, so the present trial project happened very naturally," says Prof. Lyubomir Penev, founder and CEO of ARPHA and its developer – scholarly publisher and technology provider Pensoft. "Nowadays, we are well aware that scientific findings are of little merit if 'living' in a vacuum. Therefore, we need research articles to be as discoverable as possible, and, no less importantly, to be open to feedback and further work." "We are thrilled to add this new content to the ScienceOpen as we have both strong researcher communities in zoology and in scholarly communications within our broadly interdisciplinary content. The ARPHA platform is a natural fit to deliver rich metadata to our discovery services and we are very much looking forward to working with their team," says Stephanie Dawson, CEO of ScienceOpen.